Guess what this post is about – yes TABLE CALCULATIONS…. haha. No chance. Talk to Jonathan Drummey about those. This is of course yet more info that I hope will help you guys set up a dream Enterprise Tableau deployment. Today we are gonna talk about Environments – i.e. what Tableau environments should you create in your organisation to give your team the best chance of success and keep your lovely users happy? As always, I’m not saying this is THE way to do it. There are tons of great setups out there. I’ll just tell you what we have. Feel free to suggest better methods in the comments. This section is concerned with environments that you will provide for your Tableau users to do their work. Typically this will follow the standard Information Technology Infrastructure Library (ITIL) environment definitions, but there are a few things you can do to add extra options for your users. Production – The main business & user facing environment. Content published here is authoritative, follows best practice (hopefully) and is actively supported. Development – The environment where content is first shared as part of the development process. Scratch – An extra environment for content that doesn’t need environment management. E.g. User wants to temporarily share content with a couple of colleagues. Providing these environments gives users crucial options and flexibility. Your Tableau service will most likely serve many different business areas and teams, each with different practices for content development and release management. Some teams will rigorously follow Systems Development Lifecycle (SDLC) processes, creating content in development, promoting to User Acceptance Testing (UAT) and then eventually to Production. Other teams are totally happy to change content directly in Production, as and when they feel like it. Crucially we don’t mandate what our users do, it’s a self-service model and so long as they follow their own due-diligence and governance procedures then that’s cool with me. The important thing is that we give them options to work with Tableau in the way that they want. If they break anything then they know it’s down to them. The scratch environment is an interesting concept. It started with good intentions but realistically not many people are using it. So it looks like we might bin that. Note that we use Tableau sites to segregate our environments. This is different from the above user-facing environments. These are the environments that your team uses for the service you provide. Obviously all this costs money in terms of hardware procurement and usage, depending on the spec you choose. Production – Main environment that serves your users. In our environment this also includes the UAT, Development & Scratch sites for users – but we class it all as production. That might seem odd, but remember that many teams will be development teams, and to them the development site / area is their equivalent of production. So if the development site is down then they can’t work. Disaster Recovery (DR) – For use in the event of a Production outage that can’t be easily restored. Exact same spec as Production. Totally identical, so that config can be restored and this server can be used as Production. You’ll need to make sure this environment gets the same upgrades as your Production environment. 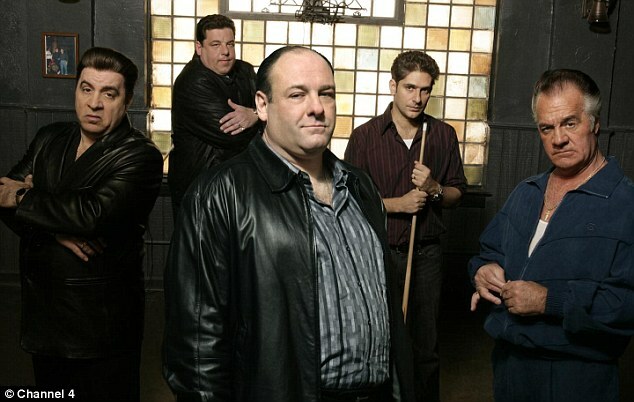 UAT – This is UAT for my team. If we want to make a change to Production, it gets final testing here. This environment is also the exact same spec as Production to ensure an accurate test. If it fails here then it’s likely to fail in Production as well. We use UAT for testing maintenance releases, config changes and other potentially disruptive non-Tableau related changes to the server. Additionally, we make this environment available to users for a couple of weeks UAT prior to releasing new versions to production. Engineering – Lower spec than prod & UAT. For testing the latest available release from Tableau. That is likely to be a higher version than production. Is useful for spotting bugs in new versions or confirming that bug-fixes work. Beta Test – We are proud to be part of Tableau’s pre-release testing audience. We use this server to test releases in the Beta programme. Lower spec than engineering. To the point that the server only just meets the minimum requirements. Alpha Test – We use this to test the alpha releases or any extra work we may be doing with developers at Tableau. We love to be involved in the genesis of new functionality. So that’s what we are lucky enough to have. It’s not perfect but it allows us to give our users a ton of flexibility in how they use Tableau, and also my own team always has a place to test new releases, plan upgrades and help Tableau with their pre-release programmes. Interested to see what the community has in terms of environments. Let me know in the comments. Remember there are a load of other posts on this blog about Enterprise Tableau considerations. Been a while since my last post. Been exceptionally busy at work due to widespread adoption of Tableau at my organisation. Usage has doubled in the last 3 months and we now have thousands of users to keep happy. That takes some doing, hence the blog hiatus. Anyway, time to continue the series on Tableau as an IT Service, with a subject that I’m asked about a lot – just how do you manage your Tableau upgrades in an Enterprise environment? This is actually a pretty big subject, especially in an Enterprise setup. There’s no perfect way to do it but hopefully some of these tips will be useful. Obviously you’ll need to make some sort of decision as to whether or not you actually need to upgrade. Each time you upgrade a production system you risk impacting stability, introducing bugs or human error. It also needs testing, planning and eats resources and time. So if there’s no good reason to upgrade, then don’t. Tableau release new versions at a pretty impressive cadence, generally once a month for ‘maintenance’ releases. So for each newly advertised release, take note of the following in order to make your decision. Compelling functionality – New features are entering the product all the time. Determine what may be useful to your user base. Key bug fixes – Each new version will squash a few bugs. If there’s one that is affecting your users then it may be prudent to upgrade and quieten the noise. Remember that your upgrade may introduce new issues. Take note of the known issues section in the release notes. Both of these are fully documented in the Release Notes. Review them carefully each time Tableau announce a new version. There are occasions where bug fixes are not announced in the release notes but your account manager will make you aware of those. Also be aware that new versions might also introduce new bugs / issues. We have had situations where we have been stable, decided to upgrade and then spent the next few months battling newly introduced issues to the point that we probably should have stayed on the older version. I hear a lot of complaints about compatibility issues between Server and Desktop. So it’s important to be aware of the behaviour between versions. Get this wrong and you may be in a position where users have overwritten content originally created in an older version and don’t have a back up to roll back to. If you are crossing major versions (8 -> 9) for example, then you’ll certainly need to upgrade the Server and Desktops at the same time. Top tip – it is possible to hack the xml of a workbook to change the version and rescue the situation, provided no edits have been made to the content. The ever-so-talented Jen Vaughan (@butterflystory) explains all here. For more details see this article. Most risk averse IT managers (like me) will resist the temptation to jump right into that new shiny Vx.0 release the day it comes out. Version zero releases of any software are notorious for bugs and issues, that’s just the nature of software development. So at my org we always let at least one maintenance release slide by and instead go to the Vx.0.1 or Vx.0.2 release. It can be hard to resist temptation, especially when your users are clamouring for that shiny new version but if there are major bugs in that zero release, then best let someone else find out about them rather than you. Caveat: This doesn’t always work of course. We waited for 9.0.2 and that ended up being one of the buggier releases. Oh the irony. This is important. You may be rocking away on your existing version, confident that your hardware can satisfy the software. But then you upgrade, and all of a sudden that new version eats up double the RAM or batters your CPU. You didn’t see that coming. For version 9 Tableau released an updated scalability document. Annoyingly it was released quite a while after V9 went live. I was expecting a comfortable read but noticed phrases like the following, which were pretty alarming. Whaaaat?! That led to some discussions with Tableau tech folks (thanks Meredith!) and some fevered testing and all turned out to be ok. But those figures took us by surprise for sure. Don’t be in a position where you upgrade and then suddenly hit a capacity issue that your older version didn’t have. Let’s say you upgrade. And it goes wrong. One of the first questions you’ll get asked is “Did you test this?”. You really don’t want to be answering “no” to that question. You should have at least one non-production environment that you can run tests on. Due to the complex nature of Tableau it is impossible to test every aspect of functionality but you should at least be able to cover a good number of scenarios. You may also not be able to simulate your production load on your test environment but it will be better than nothing. You may find the load testing utility tabjolt handy here. Check Russell Christopher’s guide to tabjolt. I have the following environments to play with. This gives me a lot of options. Ensure that the tests you conduct are consistent, repeatable and that the outcomes are recorded. We use a tool called Quality Centre and the tests are performed by my level 2 support folks. This gives consistency and frees time for my main analysts. Double check your licence maintenance end date for both Server and Desktop. If you’re out of maintenance then you won’t be able to use the application after you upgrade. I’ve seen licence issues way too many times with many applications after an upgrade. You won’t want to be trying to contact your account manager on a weekend to sort out a licence issue. Opinion – IMHO I would much prefer it if applications didn’t crap out due to licence expiration. In 99% of cases there’s some paperwork misunderstanding that is easily sorted by your account manager. By all means let the application hit you with some warnings and also alert the vendor, but it shouldn’t mean a loss of service. I’m not going to go into it here as it’s a full on subject in itself but make sure you follow your organisation’s Change Management procedure to the letter. Failure to follow change processes is generally a dismissible offence in most Enterprises. Make sure you advertise your strategy for upgrades and maintenance to your users. You’ll get asked, so ensure this is specified in your Service Document. You may even have standard maintenance windows (e.g. on a weekend) where you can reserve the right to take down the system. Again, make sure that is documented and your users are aware. Most enterprises will use some form of package deployment tool / team to perform the actual deployment of new software. That’s pretty handy. I have over 500 installations of desktop to support and we need to ensure they all get upgraded at the same time. So I can create a software bundle, send to the packaging team and they will then schedule and deploy. This gives you the chance to include those little extras in your package to give your users the best experience. Here’s what’s in our Tableau Desktop package. A sample “Getting Started” workbook with tips, best practices & help. I would love to be able to customise the “Discover” pane to point to some of my internal resources but it doesn’t seem to be possible. Boo. We also supply custom instructions for the packaging team, such as running the installer with a flag / registry update to disable the auto-update feature that has been implemented in the upcoming 9.1 release. A really baaaaad idea for Enterprise deployments. One thing to be aware of with packaging is that it can take a long time. From request to deployment, the typical time at my org is an insane 7 weeks! By which time another version is out. We are hoping to speed that up a bit obviously. You can’t over communicate any potential disruption to your service. Make sure a broadcast message goes to your users via whatever system your firm uses. And it doesn’t hurt to follow-up with your power users / senior stakeholders with a personal reminder that work is planned. Tableau is one of the easiest applications to upgrade that I’ve worked with. A simple uninstall / reinstall does the trick. But don’t take that for granted – make sure you take a manual backup prior to your upgrade. If you’re not doing this as a matter of principle then you’ll be getting a visit from the boys. And they won’t have had their dinner. Handily, the uninstall process takes a backup anyway but don’t rely on that, take your own. You should also back up all your .yml configuration files and ensure you know what each setting is. Tableau should preserve these settings during the upgrade but just in case it doesn’t then it’s handy to have a copy to refer back to. When you uninstall Tableau Server it backs up the content and the settings in the main yml configuration files. That’s cool, but do remember that if you’ve changed any of the other config files then they will be overwritten and you’ll have to make the changes again. For example we change the webserver timeout settings in the file “\Tableau\Tableau Server\data\tabsvc\config\httpd\httpd.conf.templ” – that gets blown away by an uninstall. There may also be other settings in the Postgres db that you may have modified using tabadmin. Not all are retained from what I can see. Note I’m still researching this so not 100% sure of the behaviour. Finally make sure you understand any changes to the Tableau Postgres DB schema in the new versions. It has generally remained pretty consistent but if any tables or fields are renamed then that may well break your Custom Admin Views. Not all issues come to light immediately. Perform testing, keep vigilant and liaise with your users closely in the next few days to understand if the application is behaving as it should be. 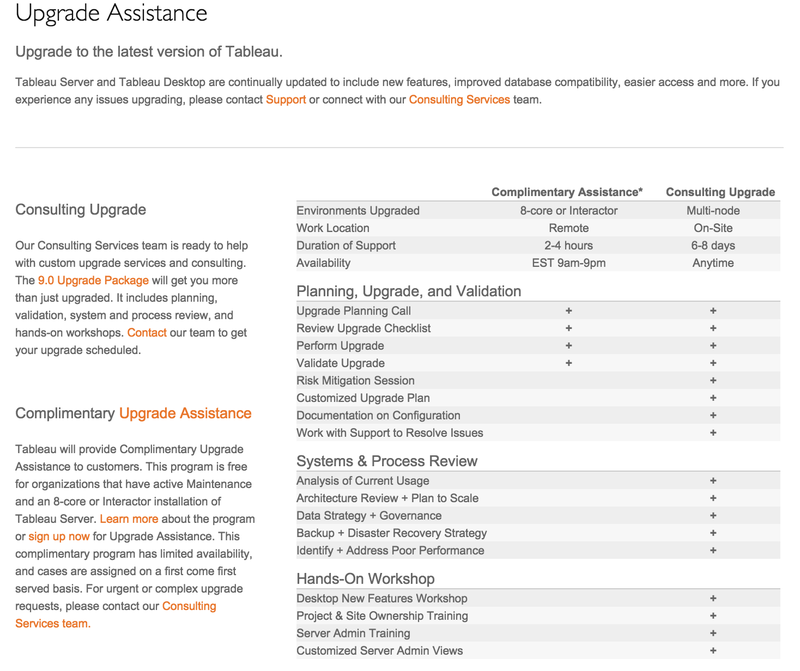 If all this sounds a bit daunting and you’d like to get assistance then Tableau offer an “upgrade assistance” programme which might be worth looking at. Talk to your account manager for more information. There are also other guides around. Have a look at this one from our good friends at Interworks. That’s it for this post. As I said it’s a big subject so do post comments if you feel I’ve missed anything.